Now you know all about last Saturday, a.k.a. the best night of my life. But I haven’t told you about Sunday yet. Well, Saturday night friends left our apartment around 1 or 2 a.m. (we invited our friends over after we all left the bar. In my blissed-out state it didn’t matter that we were still working our way through boxes and our place was still far from company-ready. Nope it didn’t matter at all!) Sunday morning I woke up at 6 a.m. and stayed in bed. Robert finally woke up at 7:30 a.m. (ha!) and asked me what I’d been doing that whole time. Calling/video-chatting/surprising close friends and family with the news. One of my favorite conversations was with my PopPop in Ocean City, Maryland. I don’t call him often enough and I feel guilty about this. But I’m so happy I called him Sunday to tell him that Robert asked me to marry him. Hearing the joy in my PopPop’s voice was the best feeling and he kept telling me what a gentleman Robert is (even though he hasn’t met him yet) based on everything I and my parents have told him. I know my PopPop will love my future husband (!!!!) the moment they meet. In fact, they often remind me of each other so hearing my PopPop so happy for us made my heart swell even more. Lounging on the couch and reading. 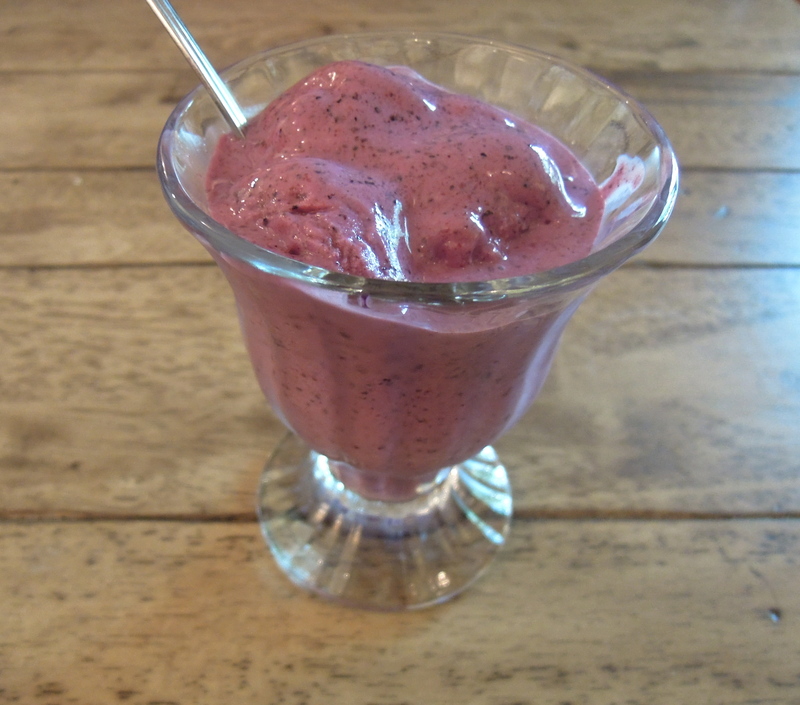 Making this blueberry frozen yogurt. Yep, I’m one lucky gal! I offered to help, I promise. I even held a box for about 16 seconds while he extracted some of the dresser parts. And I bought him a Chipotle burrito for lunch and chips and guac…which I mostly ate. But really, I was in such wonderful happiness overload and got to spend the entire day soaking it in. Now, if you’ve made fro yo before then you know that while it’s awesome straight from the ice cream maker it can become a frozen brick in the freezer afterward. Ali said that adding a splash of vodka will help maintain the creaminess. I tried this and it was a slight improvement, but was still frozen pretty solid the next day. If you have any insight please let me know (Ali?) Not to worry–it softens easily in the microwave and still tastes great. In a blender, combine blueberries, yogurt, honey, and vodka and blend until combined and almost all the black specks from the blueberry skins are gone. Add to ice cream maker and freeze according to manufacturer’s instructions. This entry was posted in Dessert on August 17, 2012 by Paige Greenfield. There just aren’t enough adjectives in the English language to appropriately describe how I feel about these brownies. 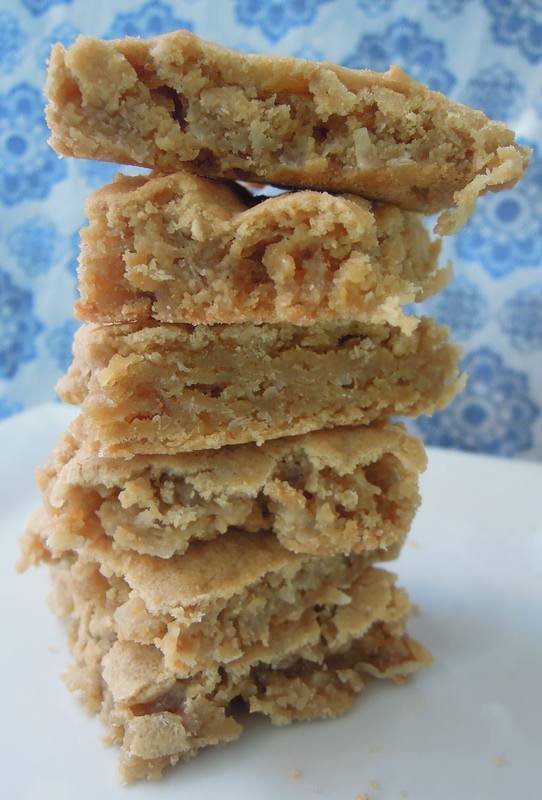 But take a closer look and you can see for yourself how they nail that combination of slight crispness on the outside–just enough to sink your teeth into–and utter chewy heaven on the inside. They’re enough to give even the world’s greatest chocolate lovers pause. And you know that perfect balance of salty and sweet? Nailed it. While I realize they didn’t exactly fit with my Mediterranean picnic theme, they make an ideal picnic dessert: Easy to make, non-melting, and easy to transport. So, clearly, I made an exception. Preheat oven to 250. Grease and flour a 9 x 13 pan. Cream butter and sugar with an electric mixer. Add eggs one at a time. Add vanilla. Sift flour, baking powder, and salt together in a bowl. Slowly add to the mixture in two to three additions. Stir in coconut. Pour into pan. Bake 20-25 minutes. This is key: Cut brownies while still warm. Allow them to cool completely in the pan before removing. 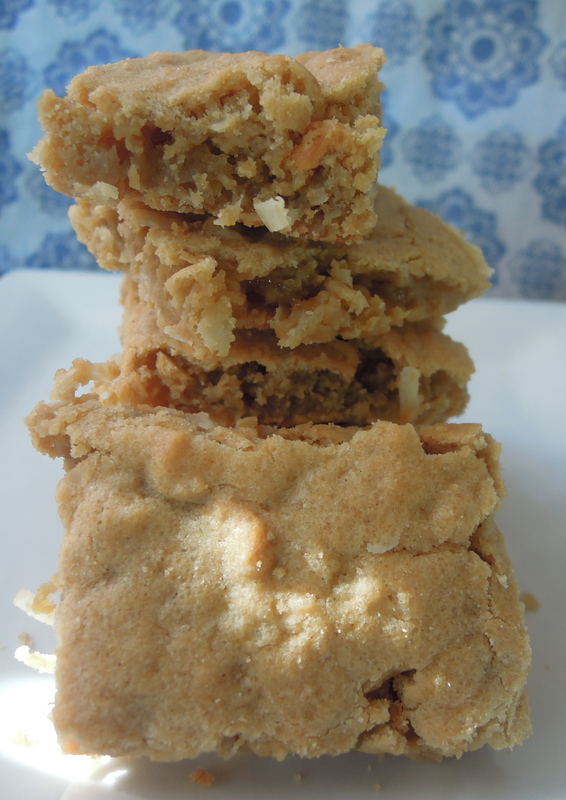 This entry was posted in Baked goods, Dessert on July 17, 2012 by Paige Greenfield. But the answer never came. I absentmindedly got caught up in the day baking, surviving the 100-degree plus heat, enjoying a wonderful BBQ with friends, watching fireworks, and trying to figure out whether it was Wednesday or Sunday. As a result, I totally forgot to snap a picture of the answer: These delicious lemon bars. 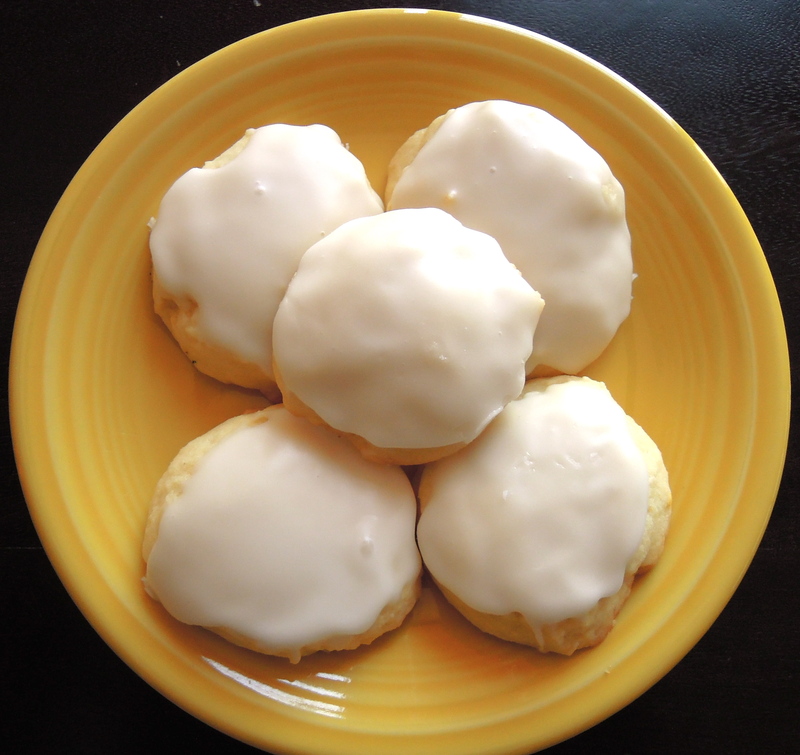 I’m still not sure what drove me to make these lemon bars (except, of course, the abundance of lemons leftover from these lemon sugar cookies). I’m not even sure I’ve ever had more than a bite of a lemon bar in my life. My Grammy used to make them for my Dad whenever my family would visit my grandparents in Ocean City, Maryland, but I always skipped the lemon bars and went straight for the frozen chocolate chip cookies. But when lying in bed the morning of the 4th, pondering the fate of my stockpile of lemons, this was the answer that came to mind. A quick Google search on my iPad landed me on a Barefoot Contessa recipe. Since Ina can do no wrong it was pretty much a done deal. I just had to get out of bed. 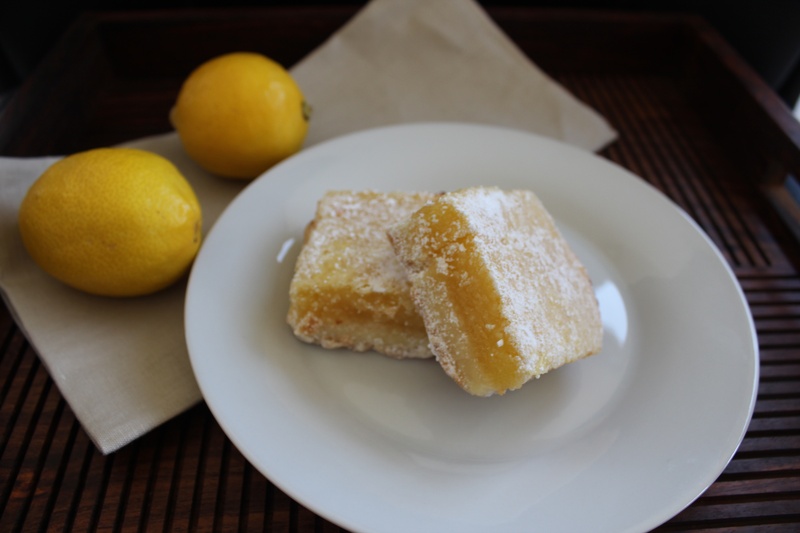 Since my lemon bar eating history is extremely limited, I’m far from the lemon bar expert. Still, I think I know what makes this recipe work: The ratio of crust to custard. It’s just shy of 50:50, which means the light, buttery crust balances out the denser, sour-sweet filling in every single bite. When I took the crust out of the oven at 15 minutes, just as the recipe suggests, I contemplated putting it in for another five because there was one barely noticeable area that had started to brown. But something held me back and I’m so grateful whatever it was (divine Grammy intervention?) did. The crust remained so light it practically melted on the tongue followed quickly by the bright, smooth filling. Find the Barefoot Contessa Lemon Bar recipe here. Thanks again, Stefanie, for hosting an incredible BBQ and for making this post possible! 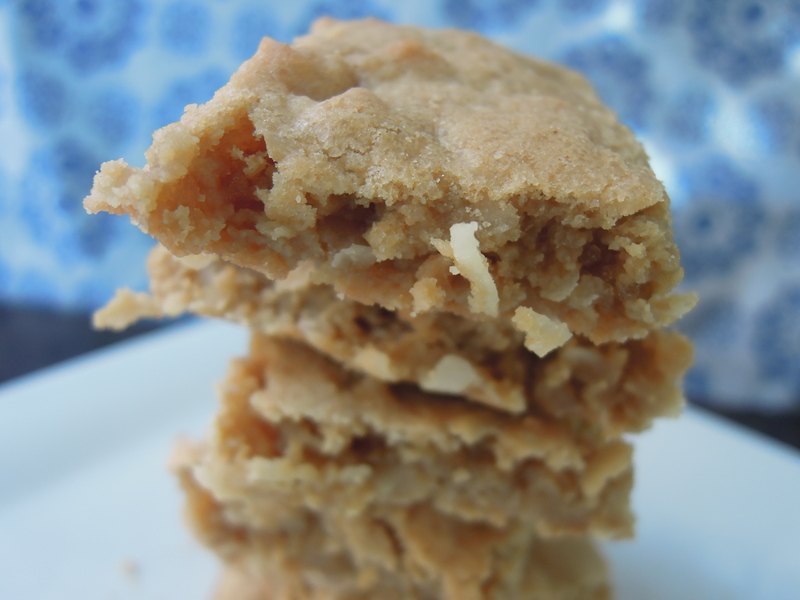 This entry was posted in Baked goods, Dessert on July 9, 2012 by Paige Greenfield. In yoga, there’s something known as the Beginner’s Mind. It’s the idea that no matter how many party tricks you can pull off or how many times you’ve done a certain pose, you try to approach it as if it’s your very first time. Not only can this make you a better yoga teacher (since it allows you to guide students safely and cleverly into a variety of different poses), it can make you a better student because you’re constantly discovering new ways to experience a pose in your body. But when you’ve been practicing yoga for some time maintaining a Beginner’s Mind is extremely challenging–it’s much easier to flip on the autopilot switch and seek out those familiar patterns your body knows so well. Yet I’ve had a few experiences in the kitchen lately that have reminded me, at least when it comes to cooking, my Beginner’s Mind is very much alive and well. There was that time two weeks ago when I attempted to create a simple meal out of simple ingredients: Garlic, tomatoes, Cannellini beans, spinach, and fettucini. I sauteed the garlic. I then attempted to cook the tomatoes down on the stovetop until they created a sauce, but somehow I ended up with olive oil splattering everywhere, which stained the new shirt I was wearing. I also burned the tomatoes so badly that I ruined the pan I was using and smoked up my apartment so much that Remy (big dog) was sneezing for an hour. (Needless to say, I had a defrosted veggie burger for dinner that night.) Every so often I need an experience like this to remind me that maybe I’m not yet ready for the training wheels to come off–that I still need to use a recipe to cook instead of attempting to make one up no matter how basic the ingredients and execution may be. Then there were these cookies. If I may take my humble hat off for just a moment I’ll confess that the execution was pretty flawless. It was the shopping part that tripped me up this time. You see, the original recipe calls for 2 Tbsp lemon zest for the cookies and 5 tsp lemon juice for the glaze. How many lemons did I buy? Six. How many lemons did I use even after doubling the amount of glaze? One. So while life hasn’t handed me too many lemons recently (knock wood), I certainly picked up enough of them on my own. My hope is that the more aware I become of my Beginner’s Mind in other areas of life (cooking is the perfect occasion) the more I’ll become conscious of it on my yoga mat. Just as I may not be ready to pull off a real meal sans recipe yet, I don’t want to try to dive into the final expression of a pose without accomplishing each building-block step along the way (I’m looking at you, handstand). And if I face-plant while attempting some crazy pose this week at least I’ll have these tangy, buttery cookies (and my surplus of lemons) to remind me of what’s possible when I go back to basics and try something new. Preheat oven to 350. In a bowl, combine flour, baking powder, and salt. In a separate bowl, combine sugar and lemon zest. Use your hands to combine. 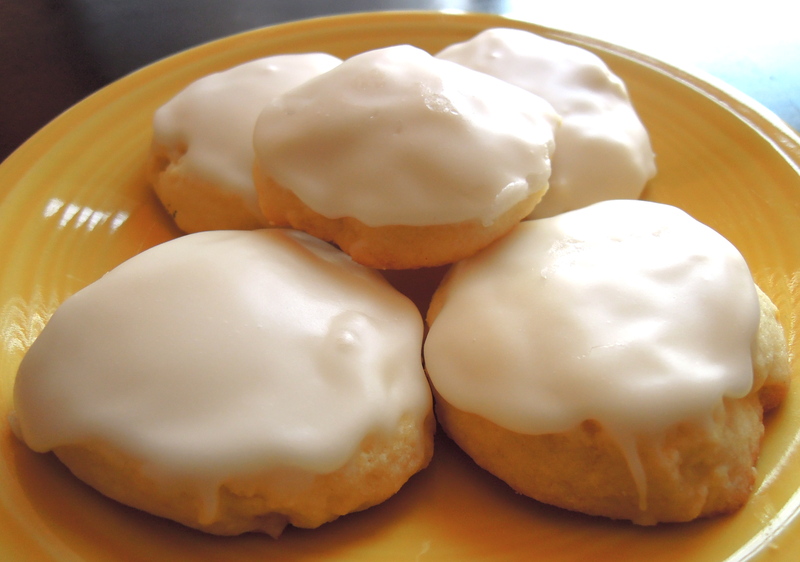 In a stand mixer with the paddle attachment or using an electric mixer, cream butter and sugar until light and fluffy. Add egg and vanilla extract and mix until combined. Slowly add flour mixture on low speed until blended. Drop dough, about 1 Tbsp at a time, on parchment-lined baking sheets. Use your palm to flatten dough slightly. Bake 11-13 minutes until bottom just turns light brown. Cool for a few minutes before transferring to cooling racks. Once cookies are cool, make the glaze: Whisk together powdered sugar and lemon juice in a bowl. Dip the top of each cookie in the glaze. Twist cookie slightly before removing from glaze to ensure the top of the cookie is covered. Place cookie back on cooling rack and allow it to sit until glaze sets. This entry was posted in Dessert on July 1, 2012 by Paige Greenfield. In my experience, you either love or hate plain, tart yogurt. Whether it’s Greek, regular, or frozen I’m in the camp that adores it and would eat it for every meal if it had the same nutrition content as kale. I still remember my very first taste of Pinkberry. At first I wasn’t quite sure what to make of it because the tangy flavor was so unfamiliar. But as soon as I stopped thinking of it as a substitute for ice cream or even soft serve (remember TCBY?) and appreciated it for what it was—its very own thing— I found that I absolutely loved the sweet tangy taste. Now, with a billion different places besides Pinkberry offering this treat (often along with a dozen other self-serve flavors) I still gravitate toward tart, often combining it with another option such as strawberry or mango. 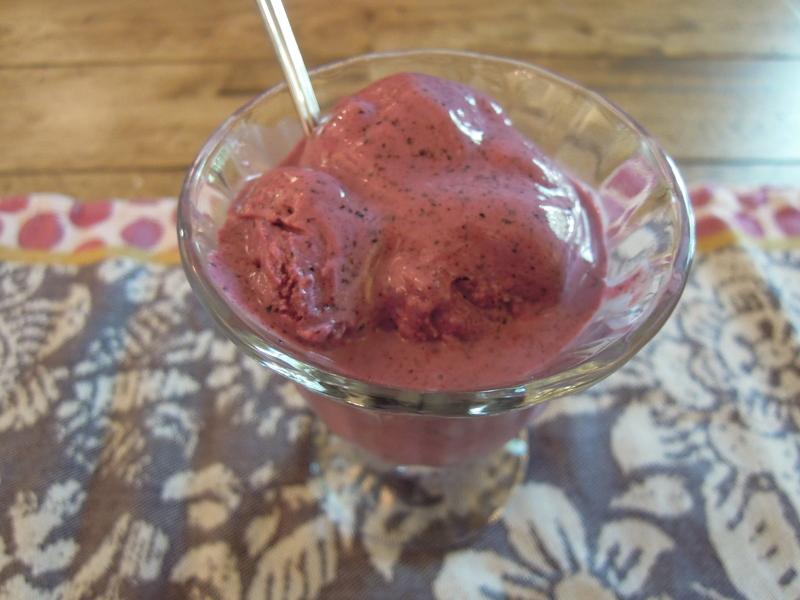 I came across this recipe that claimed to be better than Pinkberry while searching for another flavor of frozen yogurt to try (I found that one too and can’t wait to try it very soon). Whereas I thought the strawberry fro-yo I recently made was simple with just four ingredients, this one has it beat: Plain yogurt and sugar. That’s it! I’ve only made about a handful of different ice cream/frozen yogurt flavors in my ice cream maker so it continues to be a learning experience for me. The strawberry frozen yogurt was out of this world, but my only complaint was that it got hard as a rock in the freezer. (I actually had to microwave the glass container it was in in order to be able to scoop some out so I could eat it–not ideal in the texture department.) In reading the comments to this plain frozen yogurt recipe (yes, I’m a comment reader) I found that David Lebovitz, the ice-cream guru himself, left one. (Sidenote: If he ever commented on my blog I’m pretty sure I’d spontaneously combust into a million little pieces.) 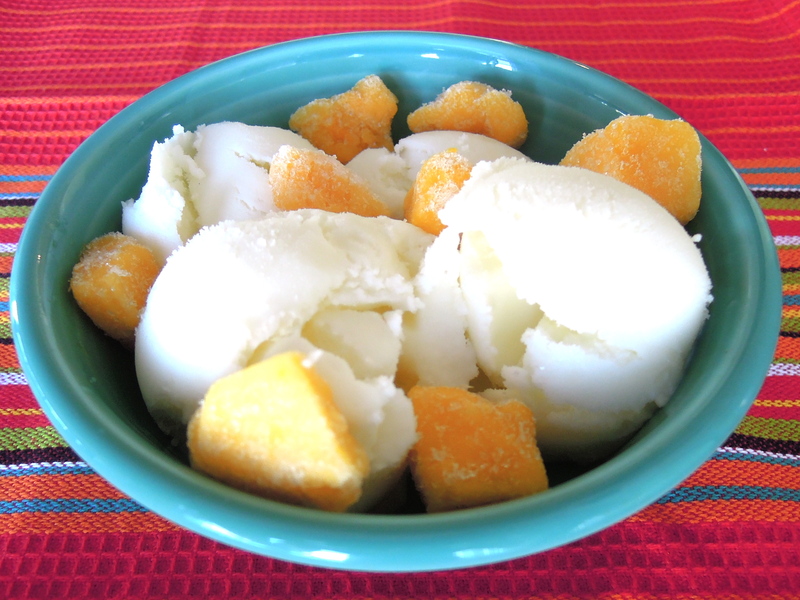 In it, he suggests using full-fat plain yogurt instead of non-fat so it doesn’t get too firm in the freezer. Ah ha! Here I just thought my freezer was exceedingly freezing. And while many other fro yo recipes suggest straining the yogurt he says you don’t have to (good thing since I stop reading at the word cheesecloth). So I heeded his advice, mixed plain yogurt with sugar and voila: A frozen yogurt recipe that far and away rivals Pinkberry’s and for the price of a container of (organic) yogurt—a success indeed! Combine yogurt and sugar in a bowl. Cover and refrigerate for one hour. Freeze in ice cream maker according to manufacturers’ instructions. Note: I’m sure you could make this with plain non-fat yogurt (and I plan to try it soon). The taste will likely be very similar, but it will firm up in the freezer. This entry was posted in Dessert on June 14, 2012 by Paige Greenfield. I believe that every person has a secret list of “would-be-nice-to-have” qualities he or she hopes the person he or she falls in love with possesses. I’m not talking about things like has a job, went to a respectable college, and has all of his/her teeth. Those are requirements (at least in my book). I mean the silly, frivolous stuff you hope he or she has that you may or may not admit to your closest friends. 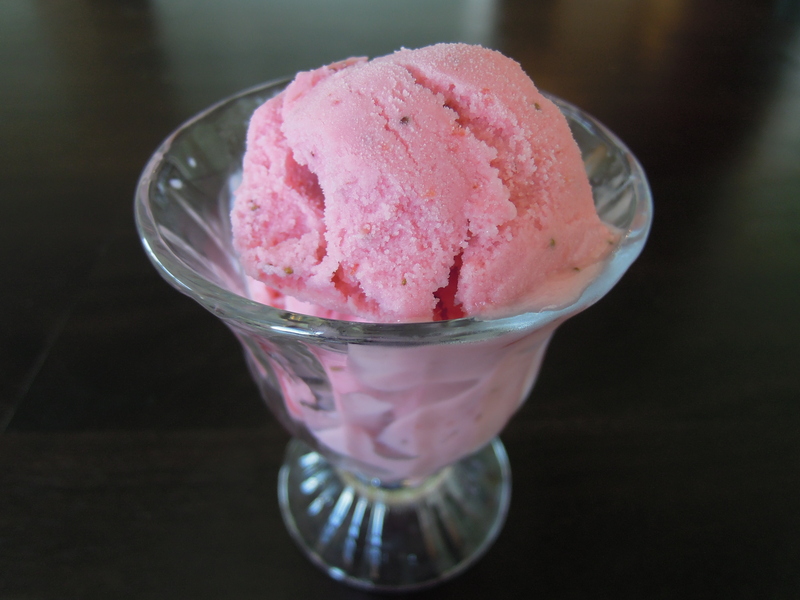 So with our shared love of fro-yo in mind I knew I needed to make this homemade strawberry frozen yogurt recipe the moment strawberries were in season and I had just a little bit of time. That moment finally arrived last weekend. 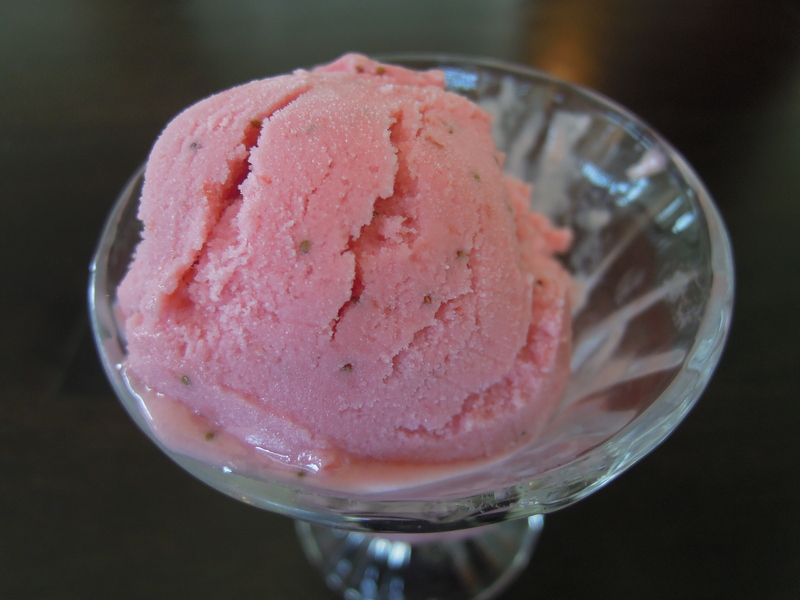 And let me just say this about the recipe: It was so fantastic—the perfect combination of ripe strawberry flavor and creamy texture—that I whipped up a second batch as soon as I finished making the first one. Bonus: It only contains four simple ingredients. Enjoy! Place sliced strawberries in a bowl with sugar and mix to combine. Cover with plastic wrap and allow to sit at room temperature for about 1 hour. Combine strawberries, Greek yogurt, and lemon juice in a food processor or blender (I used the VitaMix) and pulse/blend until smooth. Pour mixture into a bowl, cover, and refrigerate for at least 1 hour. Proceed to freeze in your ice cream maker according to manufacturer’s instructions. This entry was posted in Dessert on June 4, 2012 by Paige Greenfield. For our first ice cream maker experiment we played it safe and made a batch of delicious vanilla bean ice cream. After nailing that flavor, it was time to get a little more adventurous. Next stop: Mint chocolate chip. One of my absolute favorites. This is actually the second time I’ve made it in two weeks because the first time just wasn’t minty enough (although that didn’t stop us from scooping up every last bite). I wanted to be sure that increasing the quantity of mint extract to 1 1/2 tsp would provide that refreshing minty flavor without being too overpowering. It definitely earned the lick-your-lips seal of approval. 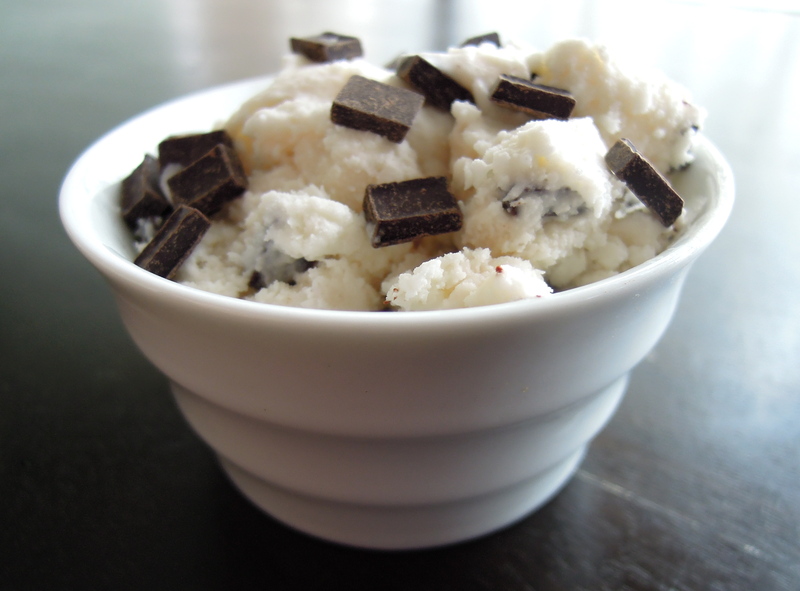 While mint extract works perfectly for now, I’ve already bookmarked a few mint chocolate chip recipes that use fresh mint. The idea of using fresh mint in the middle of winter just feels wrong, but I’m thinking that, come spring, growing a mint plant in my windowsill will be the perfect excuse for endless batches of mint chocolate chip ice cream, mint juleps, and mojitos. 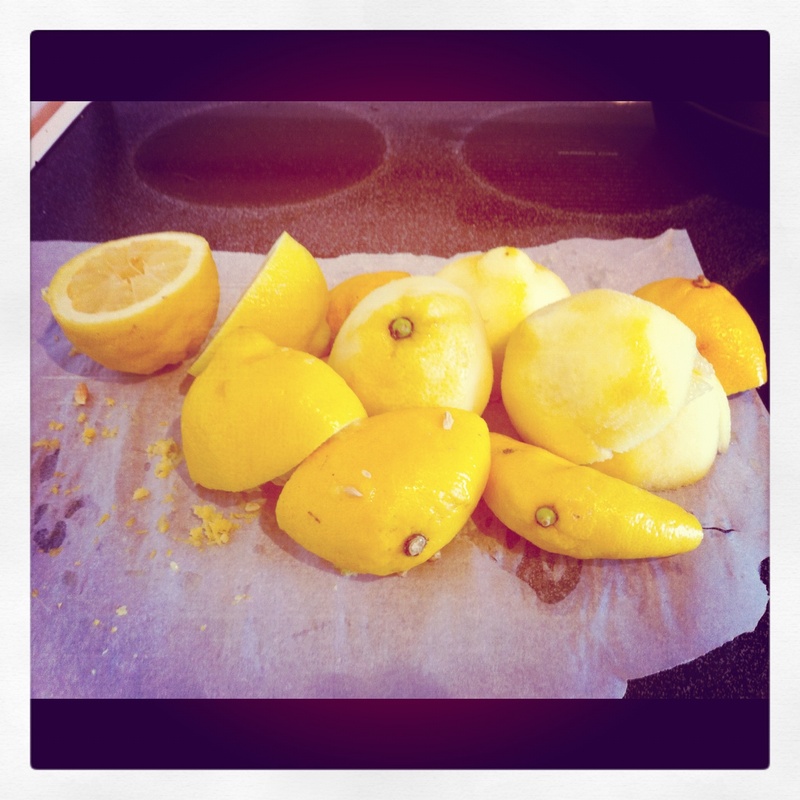 This entry was posted in Dessert on January 22, 2012 by Paige Greenfield.